“Do not focus your cameras below his waist.” This was the directive to the cameramen on the Ed Sullivan Show Sept. 9, 1956. You could do that on television. In a live concert, there was no way to censor Elvis’s gyrations. Whatever Ed Sullivan and the show’s producers expected, they were surprised by the polite young man who called them all “sir.” By the time he sang his second set, the cameramen got the okay to film whatever they wanted. Elvis was born in Tupelo, Mississippi in 1935, one of identical twins, but the twin, named Jesse, born first, had died just before birth. Elvis and his mother felt very close to Jesse, always remembering him. Elvis, a shy mama’s boy, found release in singing. On his 10th birthday, he was hoping for a rifle. Or a bicycle. He got a guitar. Everyone who heard him play knew he had talent, but he was so different it made people wary. In school, he only failed one subject – music. He never learned to read music. He was rejected by the Arthur Godfrey Talent Show. 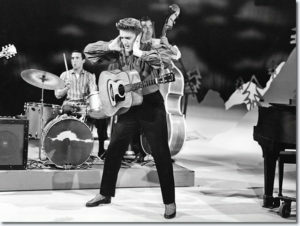 When he was 20, Elvis made his TV debut on the Dorsey Brothers’ Stage Show Jan. 28, 1956. He sang Heartbreak Hotel. 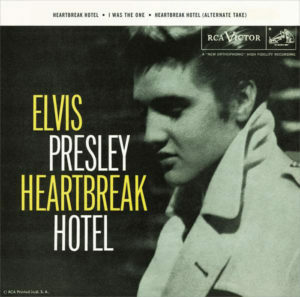 In mid-August, 1958, Elvis’s mother was in the hospital. One night, Elvis was so exhausted his father sent him home from the hospital to sleep. His mother died that night. When Elvis got to the hospital, he got the awful news. People close to him said Elvis was never the same after that. 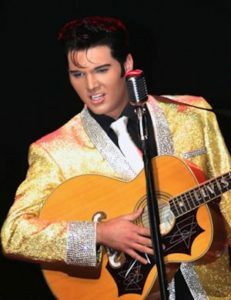 Even though Elvis’s life spiraled into drugs and weight problems, he still was able to put on fabulous stage shows. 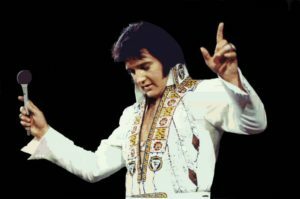 In Indianapolis on June 26, 1977, he gave his last concert, thrilling his audience with his magnificent voice and his inveterate showmanship. 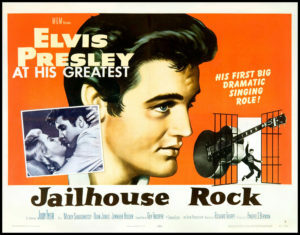 Movie poster for Jailhouse Rock. Really enjoyed your post. Elvis seems forever young! This is so nicely written. I’m not an Elvis fan, but it captured my interest. Great story. Didn’t know Elvis was so tender!